Regency at Brier Creek Country Club in Raleigh enjoys a prime location in the middle of North Carolina's popular Triangle area. While Brier Creek is open to all ages, the Regency neighborhood in the community is age-targeted towards mature buyers and includes low-maintenance homes designed to appeal to active adults. These elegant ranch homes include desirable features such as spacious master bedroom suites and over-sized two-car garages. Set within 15 minutes of downtown Raleigh, Durham and Chapel Hill, Regency at Brier Creek offers close proximity to many shopping, dining and cultural attractions. Within the community, residents will enjoy such amenities as the 18-hole championship golf course, the Swim and Tennis Pavilion, and the 40,000 square-foot clubhouse. Regency is the age-targeted neighborhood of the larger Brier Creek community. As such, Regency offers its homeowners access to all of the same amenities offered to those who live throughout Brier Creek. These spectacular amenities are centered on the 40,000 square-foot clubhouse and the 18-hole Brier Creek golf course. This championship course, designed by Arnold Palmer, provides challenging and flexible play with four sets of tees that allow players to stretch the course from 5,352 to 7,029 yards. The amenities continue at the Swim and Tennis Pavilion. Here residents can enjoy an eight-lane 25-meter competition pool, a recreational pool, and a 115-foot water slide. There are also four clay and two hard surface lighted tennis courts. Indoors, the impressive clubhouse features a state-of-the-art fitness center compete with cardiovascular and strength training equipment, steam rooms, massage rooms, and men's and women's locker rooms. Deke's Grill, overlooking the golf course's 18th hole, offers casual dining throughout the day. The menu features American cuisine with daily specials, and the restaurant's patio provides a lovely spot for dining alfresco. Active adults will love the low-maintenance single-family homes found in the Regency neighborhood of Brier Creek. While the master-planned Brier Creek community will eventually have over 1,000 homes, the intimate Regency neighborhood includes 123 brick ranch homes, which range in size from 1,825 to over 3,000 square feet. These elegant homes are available in many different floor plans. Homeowners can choose from thoughtfully designed two, three and four bedroom models, to meet their own particular needs. The homes in Regency at Brier Creek offer many desirable features, such as gas log fireplaces and gourmet kitchens. Various floor plans include plenty of living space, including great rooms, Carolina sunrooms, covered porches, and optional basements. Active adults will particularly enjoy the comfortable eat-in kitchens, spacious master bedroom suites, and over-sized two-car garages. While the Regency neighborhood within Brier Creek is age-targeted with homes designed for active adults, the rest of the community attracts residents of all ages. This is an ideal situation for those active adults who like the idea of owning a low-maintenance home that is likely to be set among peers, while still living amid the vibrancy of an all-ages community. There are plenty of activities available through the Brier Creek Clubhouse, including programs that appeal to mature adults and those that are designed for all ages. Regency at Brier Creek is located in Raleigh at the center of the Triangle, one of North Carolina's most popular areas. This prime location features easy access to a number of shopping, dining, recreational, and cultural attractions. Brier Creek is approximately a 15-minute drive from downtown Raleigh, Durham and Chapel Hill. Active adults who choose to live at Regency at Brier Creek will be happy to know that The Triangle area also boasts excellent health care. While those who love to travel or have out-of-town guests will enjoy the convenient access to the Raleigh Durham International Airport. 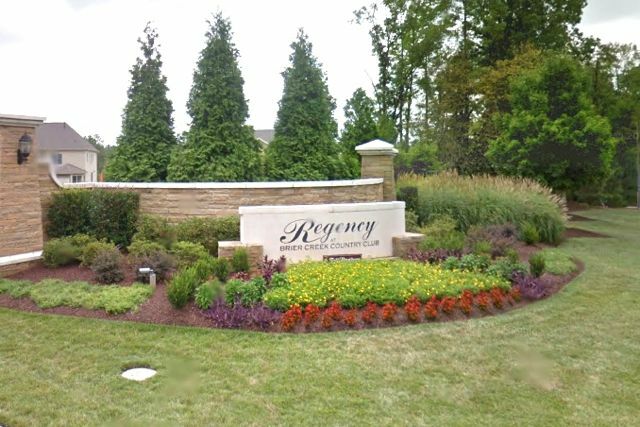 Regency at Brier Creek is a wonderful active lifestyle community in Raleigh, North Carolina.